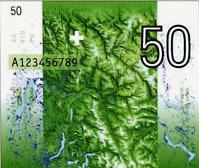 The Swiss National Bank had a contest to find new banknote designs and they are extremely cool. I especially like the maps on the 1st place entry. Maps make everything better. In other Swissish news: did you know you can get a USB powered fondue pot? Hot sticky cheese has never gotten so close to your keyboard! Actually it is just a joke; the 2.5W maximum that USB can provide is not likely to melt much beyond a thimble of that florescent orange cafeteria nacho crap. Speaking of which, since we are obviously on track to having a USB powered version of everything in the world (at least in our imaginations), can I get a USB powered particle accelerator? If we can keep the power consumption down to where it can share the bus with a fondue pot that would be great.